Are Commercial Picnic Tables All The Same? Are All Commercial Picnic Tables the Same? They are all the same… right? An ever-conscious public has been the influencing factor that brought about new construction in commercial picnic tables most prominent were the metal tables. To enhance comfort and durability to metal tables, a thermoplastic powder coating was offered. Then came the production of aluminum picnic tables, which were for lightweight convenience. 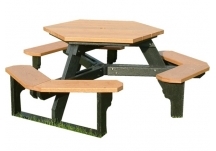 Recycled plastic picnic tables are popular today as they are an environmentally friendly product. Let's look at metal tables, and you decide. The first differentiating factor is gauges; the smaller the number gauge, the stronger and thicker the steel. Gauge availability runs from 3-gauge to 36-gauge. 11-gauge steel would be ideal for an outdoor school lunch area. 36-gauge steel would be an excellent choice for playground equipment. The addition of thermoplastic coating to metal tables aids in corrosion prevention and minimizes maintenance. It holds up better during extreme weather. It's great seating for those who are wheelchair bound. It is ideal for parks, coffee shops and areas with more adults and older children. It is more susceptible to dents from abuse or vandalism. If you're shopping for a metal picnic table see our selection! 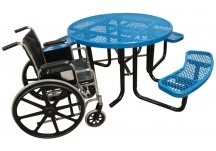 Aluminum picnic tables are typically made from strong aluminum tubing with composite tops. While they don't compare to the traditional metal picnic table, they are a mainstream choice for municipalities and park grounds due to their: lightweight construction, low maintenance costs, and versatile characteristics. If you're shopping for an aluminum picnic table see our selection. Environmentally-friendly commercial picnic tables are nontoxic, nonporous and long-lasting substitutes for the typical metal picnic table. The vast majority of these "green" alternatives are manufactured from 100% recycled plastic. These benches are a constant reminder to all of us to be successful stewards of the environment. Shop our selection of plastic picnic tables. Wood picnic tables offer a classic look to any park. These tables require more care and upkeep than picnic tables made from other materials, but replacing the wooden slats are a quick and easy solution when older wood is beyond repair. All commercial picnic tables are not the same. Options are available in material construction, style, color, size and availability. List your "must haves" and your "wants" then comparison shop. We offer picnic tables in every material, style, color, and size — we even offer a low price guarantee!